This issue’s article is taken from a document produced by Dr S. K. Cosmic Kapoor. Dr Kapoor intends to take on the task of disseminating Vedic Mathematics in India and we wish him every success. Details of Dr Kapoor’s latest book are given later in this newsletter. Vedic Mathematics, with Ancient wisdom as its source, has powerful potentialities to achieve perfection of intelligence for young minds. With this, as an inspiration together with the personal experience gained during more than two decades of research in this domain, it is my firm conviction that the discipline of Mathematics deserves to be approached the Vedic Mathematics way. It is in this light that I draw the first outline of VM Project and title it as such. Aim of the project, as is being visualized, is to attain Mathematics Literacy for one and all and that too of the order of perfection of intelligence attainable by individuals as per their age. The text material is very brief, as being just 16 Sutras and 13 Up Sutras availing in all only 520 syllables, and as such, the whole exercise is to avail the oral traditions of instructions to bring objectivity well within the range of subjectivity as an experiential mode of simultaneous internal and external parallel expansions. Dr Kapoor’s approach to Vedic Mathematics is a geometric one, based on the structure of the Vedas and the Vedic literature. This therefore offers a new approach to the teaching of mathematics, which has many important and profound implications. 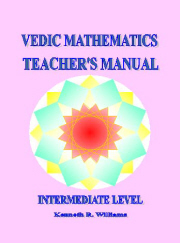 Though children deserve and expect a holistic education modern teaching remains fragmented and lacks coherence, so the unified approach to mathematics teaching outlined in this book and based on Vedic texts is very welcome. Dr Kapoor has demonstrated that the organization of knowledge in the Vedic literature mirrors the structure of Vedic Geometry. This Vedic Geometry transcends our familiar three-space geometry as it includes higher-dimensional spaces; all spaces having a four-fold structure. These are real spaces, which can be experienced by transcending the lower-dimensional spaces. The practice and understanding of transcendence is vital in education. Higher states of consciousness, which correspond to the experience of higher-dimensional spaces, need to be included in any educational system so that children recognise what they are already aware of: that reality goes beyond the familiar world of three-dimensional space. Every discipline should be taught in a way that brings out its full range and potential. The Ganita Sutras expounded by Sri Bharati Krsna Tirthaji cover all of mathematics, both pure and applied, and as Dr Kapoor has shown, these have their own geometric format. Dr Kapoor’s approach to the teaching of mathematics is therefore a coherent and integrated one, which can transform mathematics education into a powerful tool for individual development. But first teachers must learn the Vedic system and how to teach it, and to this end Dr Kapoor has given courses on learning and teaching Vedic Mathematics which are currently being made freely available on the Internet. Real attainment of this approach is to have perfection of intelligence to attain natural transition from intelligence format of brain to consciousness format of mind. It is here where the mind’s eye simultaneously chases subjectivity and objectivity as parallel expansions. And, with it the whole range of inner and outer folds of manifestations all round go transcendental for blissful existence of the order of NATURE. It would be my privilege to come forward with introductory demonstration to feed the curiosity of the institutions, interested in this approach of Vedic Mathematics to discipline of mathematics, more especially for coherent and integrated approach for perfection of intelligence and attainment from intellectual format of brain to consciousness format of mind. On 27th April,2004 Debmalya Banerjee will be conducting an Introductory workshop on Vedic Math`s at Birla High School (Junior Section). 55 teachers of Birla High school (Junior Section) shall attend the same. Take-Home Worksheet shall also be given. The workshop will be of 2.5 hrs. duration. The workshop will be held under the banner of the World Academy of Vedic Mathematics. Timings: 1130-1400 hrs.
. Nearly 900 scholars across the globe are expected to participate. Editor: we are not aware of a presentation on Vedic Mathematics being planned for this but perhaps someone on our mailing list would like to offer a paper. Recently I attended your Vedic Maths classes at Lohana's classes. It was such a wonderful experience for me and want to thank you for the same for taking such a wonderful initiative. It is nice to learn vedic mathematics and disappointing to know that such great methods of Indian origin are not taught in our schools. Just to introduce myself, by profession I am Computer Engineer and IT consultant with almost 12 years in this industry and carried out various software projects in India and Overseas. I wish that if time permits and I can again participate in your class to strengthen the techniques. A new book, "Learn and Teach Vedic Mathematics", has been published by Lotus Press (Publisher and Distributors) 4263/3 Ansari Road, Daria Gang New Delhi Pin-110002 (Phone 30903912). It is with ISBN Numbers as ISBN 81-89093-00-2(HB), ISBN 81-89093-00-9 (PB). Another article, by Marco Swaen, has appeared in the Dutch journal ‘Pythagoras’, April 2004 edition. It is called "Rekenen met sutra’s – Delen met een cijfer op de stok" and is on the method of straight division. Two articles by Kenneth Williams are now available on the internet at www.vmacademy.com, as promised in Newsletter 35. These are entitled “The Sutras of Vedic Mathematics” and “The System of Vedic Mathematics”. EMAIL: By the way: I told my students a thing or two about vm and some of them were delighted to see how easy and straightforward it was even though they are used to do most of their sums on a graphic calculator. am a Research Scientist and I have found vedic maths to be of immense help in performing quick calculations for experimental data without seeking the help of a calculator. EMAIL: I hope you don't mind me writing to you but I couldn't resist the urge to share my thoughts and comments. I just started reading your advertisement page and was quite amazed to discover that someone actually has created a course to teach what I instinctively taught myself from primary school age. I never did maths conventionally, fortunately the maths teacher I had in high school was quite tolerant of my unusual methods and didn't try to force me to do things "by the book". For as long as I can remember I have used addition to subtract, can multiply 3 digit numbers by 999 in my head and I agree with you that it is not necessary to learn all the times tables to be able to multiply (although I did as a kid like everyone else). I never thought kids were being taught maths the right way, but didn't really imagine it was possible to "change the system" so I merely imparted a few of my "ideas" to my own children (only one of my 5 was really interested though). I hope that your program makes a big impact, especially on the outdated educational system.